Let's hear it for the great state of California! And, not just because it's the birth state of Yours Truly. The Golden State will be represented to the fullest at this years National Endowment for the Arts Opera Honors - which boasts an operatic a-list of stars. 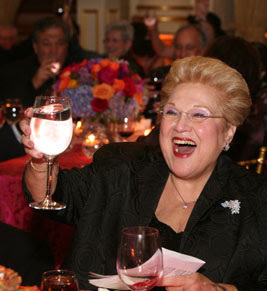 The honors will be bestowed upon mezzo-soprano Marilyn Horne (pictured right at her birthday party) who not only began her career in L.A., but also currently runs Santa Barbara's Music Academy of the West's vocal program and the Marilyn Horne Foundation, composer John Adams, who is based in the Bay Area and has close ties to the Los Angeles Philharmonic, and Lotfi Mansouri, former general director of the San Francisco Opera, whose wide-ranging career began in L.A. and continues with frequent directing at San Diego Opera. These Californians will be honored alongside NY City Opera conductor Julius Rudel and director-librettist Frank Corsaro. In addition to the distinct honor of receiving the prize, $25,000 will also be given to each recipients. The celebration, which is to be held at Harman Center for the Arts in Washington, D.C., will be presented in partnership with Opera America and Washington National Opera. It will feature musical tributes from soprano Angela Brown and baritone Gordon Hawkins, as well as a video tribute to each recipient. Not only is the honors list amazing, but the presenters list is equally as stellar. On the list: Andre Previn will be the presenter for Mansouri, Broadway and concert singer Barbara Cook will present to Horne, soprano Shirley Verrett is Rudel's presenter, and composer Carlisle Floyd, who collaborated often with Corsaro, will present his award. Floyd was one of the four inaugural NEA Opera Honors recipients last year, along with soprano Leontyne Price, conductor James Levine and opera administrator and advocate Richard Gaddes. Why on earth is this not being televised? This is big stuff! Alas, we'll have to settle for the old fashioned method made new. The WFMT Radio Network, based at Chicago classical station WFMT, hopes to send the live broadcast to more than 150 radio markets. For those who are not part of those markets, wfmt.com will carry the proceedings live starting at 4:30 p.m. PST on November 14. But, you better carve out the time to listen because it has been reported that the program won't be archived for later listening. The NEA Opera Honors kicks off National Opera Week, which runs from November 13 - November 22. According to Opera America, National Opera Week will celebrate opera in America as a contemporary cultural expression. For more information, see the links below. Included in the list of National Opera Week events held around the country are the annual Opera News Awards and the annual Richard Tucker Music Foundation Gala; both in New York. For more information on the NEA Opera Honors, you can visit the NEA website. To find a National Opera Week event in your area, you can visit the Opera America website. Here's where you can find out more about the Opera News Awards and the Richard Tucker Foundation Gala. John Adams, Lotfi Mansouri, Marilyn Horne, Julius Rudel, Frank Corsaro, soprano Angela Brown, baritone Gordon Hawkins, Opera America, Washington National Opera, Los Angeles Philharmonic, San Francisco Opera, San Diego Opera, Music Academy of the West, NY City Opera.